Atopic dermatitis (eczema) is a disorder that causes itchy, red, cracked skin that is also prone to infections and thickening. Currently there are no available treatments for this disorder. Therefore, patients must rely on steroid creams to relieve their symptoms. Previous research has determined that eczema is linked to a gene mutation. Given the similarities of pig and human skin, a treatment, initially developed in mice, was next evaluated in research pigs. 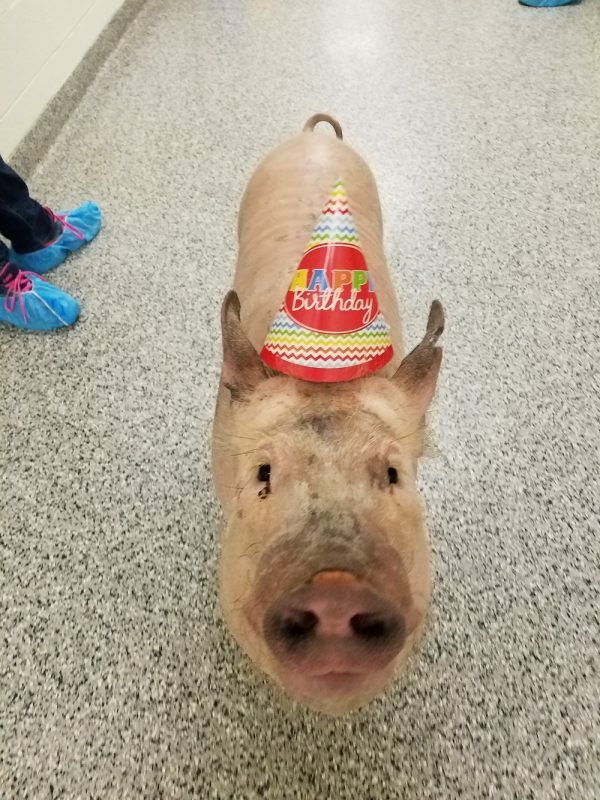 Dash was one of the pigs involved in this study. The research project has been completed so Dash will now be retired to live out the rest of his life on a farm. Dash will be missed by his caretakers so here you see them celebrating his birthday as they prepare to send him off to his new home.